Entrance into Rotorua’s most active geothermal park featuring a walkway lined with unique geothermal wonders and interactive opportunities. 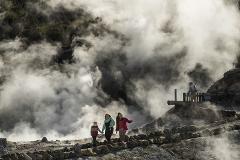 Combine the Geothermal Park Entry with a relaxing sulphur spa and explore the geothermal area of Hells Gate before a revitalizing soak in the sulphur mineral water. 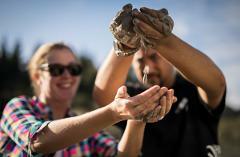 Enjoy a relaxing and therapeutic Mud Bath and Sulphur Spa at Rotorua's most active thermal park. Combine relaxing special geothermal muds and sulphurous waters with an exploration of Rotorua's most active thermal park at Hells Gate. Indulge and relax with a Hells Gate Sulphur Spa. Let the naturally heated geothermal waters renowned for their curative and invigorating properties rejuvenate and replenish you. 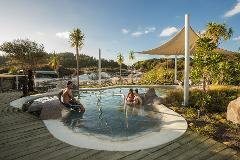 Enjoy a relaxing and therapeutic private Mud Bath and secluded Sulphur Spa at Rotorua's most active thermal park. Combine relaxing special geothermal muds in your own private mud bath and sulphurous waters with an exploration of Rotorua's most active thermal park at Hells Gate.